Are you an expat living or working in Brno in a creative profession? Entrepreneur, lecturer, chef, manager, student, programmer, artist, researcher, architect, designer etc.? Join us at the informal meeting to be held in the atrium of the Faculty of Social Sciences, Masaryk University, Joštova 10 on Thursday, June 10, from 5pm. You will have a chance to network with other expats from creative professions and meet the key influencers & initiatives helping them to feel at home in Brno. Please register for the meeting by sending a pure e-mail with your name, nationality and profession at events(at)brnopolis(dot)eu. Do you have friends or colleagues who are expats in creative professions or industries too? Let them register and bring them along. Dress casually, bring smiles, read our serie What expats in Brno say. The event will be made in cooperation with the City of Brno (under the aegis of the City Mayor, Roman Onderka), Infosys, Moravia IT and GTS Brno - A Lufthansa Company. Thank you all for your registrations. 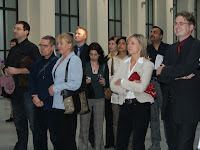 We got over 90 people of more than 25 nationalities on the list. The registration has been closed now.